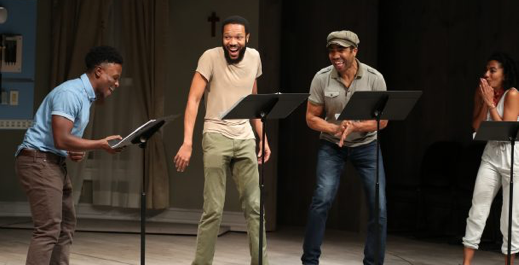 The Dramatists Guild Foundation (DGF) has announced that it will be bringing its Traveling Masters program to Ohio and Minnesota over the course of this month. Traveling Masters is a nationwide education program providing master classes and events on the craft of writing. The program presents an incredible opportunity for students, aspiring professionals, and theater lovers to connect with the giants of American theater to be inspired, challenged, and empowered. Participants get the chance to interact with award-winning writers, allowing them to learn, ask questions, and develop their talents with input from true experts. Participants in each of these states will gain insight into the real-life experiences of these renowned playwrights. Steve Yockey will be in Cincinnati on April 20. Steve Yockey is a Los Angeles based writer with work produced throughout the US, Europe, and Asia. His plays Bellwether, Pluto, Afterlife, Octopus, Large Animal Games, CARTOON, Subculture, Very Still & Hard to See, The Fisherman’s Wife, Wolves, Disassembly, and Niagara Falls & Other Plays are published and licensed by Samuel French. Other plays include Blackberry Winter, The Thrush & The Woodpecker, and Mercury. This season: Reykjavík will open as a National New Play Network Rolling World Premiere at Actor’s Express (Atlanta), Rorschach Theatre (DC), Kitchen Dog Theatre (Dallas), and Southern Rep (New Orleans) and Sleeping Giant will premiere in the 2019 Edinburgh Fringe Festival. Steve holds an MFA from NYU’s Tisch School of the Arts and currently serves as a writer/producer for the television series Supernatural. To learn more about Steve Yockey’s events in Cincinnati, please email info@dgf.org. Daniel Alexander Jones will be in Minneapolis on April 25. He is an acclaimed interdisciplinary artist. Performance works include Black Light (Public Theater, Greenwich House Theater), Duat (Soho Rep), An Integrator’s Manual (La MaMa), Bright Now Beyond (Salvage Vanguard), and Radiate (Soho Rep and National Tour). His alter-ego, Jomama Jones, is completing a forthcoming fifth album of original music, Anew, for release in 2019. Among many honors, Daniel received the Doris Duke Artist Award, the Alpert Award in the Arts, and was in the first class of Creative Capital grantees. A primary contributor to the Theatrical Jazz Aesthetic, he is Associate Professor of Theatre at Fordham University. Daniel Alexander Jones began his relationship with PWC as a 1994 Many Voices Fellow, was a Jerome Fellow, and held a McKnight National Residency. Jones will be presenting excerpts from his upcoming book and participate in a conversation about the intimate relationship between creative practice and personal transformation. The evening will be facilitated by Professor Sarah Myers of Augsburg University and feature Jones’s longtime collaborator Elissa Adams. To attend this reading and conversation, you can reserve a ticket here. The Dramatists Guild Foundation will be presenting these Traveling Masters in partnership with Know Theatre of Cincinnati and Playwrights’ Center. If you will be in any of these areas during this time and would like to know more about the public events with these writers, please reach out to info@dgf.org.